Still have a set, in the tall can. My daughter now 25 loved them too. We went to some friends house and played with a set of Lincoln Logs for hours. When Christmas came around, we had our own set...and didn't even touch them. Boy, was mom mad! 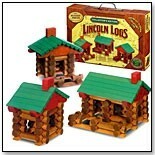 My son got a set of Lincoln logs for his third or fourth birthday.